Brexit secretary David Davis said the aim was to ensure EU citizens resident in the UK would after Brexit have ‘almost the same rights as British citizens’. Theresa May said ‘We won’t be seeing families split apart’. But rights to bring in family members without difficulty are among the free movement rights EU residents in the UK will lose under the proposals published on 26 June. The EU’s offer to British citizens living in other member states, presented to the government on 12 June, is based on the ‘standstill agreement’ model, and would preserve all the free movement rights holders currently have – not just to move around the EU, but also to have families join them in any country in which they live. It is unlikely that this offer will remain on the table unless it is reciprocated by the British government. But the British proposal offers far less security, and far fewer rights. Which EU nationals qualify, and for what? Under the British counter-proposal, ‘qualifying’ EU nationals will get – if they apply for it at any point during a two-year grace period – settled status, or indefinite leave to remain (ILR) under UK domestic law, once they have been in the UK for five years (those with less than five years’ residence will get temporary residence status until they qualify for settled status). This status sounds permanent, but if the holder is out of the country for over two years, she may suddenly find (like Irene Clennell) that she has lost her residence rights completely. Not all EU nationals will be eligible, only ‘qualifying’ ones – and although the term isn’t explained in the document, the use of this word indicates that the government is likely to try to exclude from the scheme those EU nationals, often from eastern Europe, who are unemployed or precariously employed, and/ or homeless. The Home Office practice of rounding up, detaining and deporting EU nationals who are sleeping rough appears to defy EU free movement law and is being challenged in a judicial review by the Public Interest Law Unit at Lambeth Law Centre and North East London Migrants Action (NELMA). Those EU rough sleepers who have not been removed from the country for alleged ‘abuse’ of free movement rights by the government’s cut-off date are unlikely to be considered eligible for settled status, which will depend on proof of residence for five years and an assessment of ‘conduct and criminality, including not being considered a threat to the UK’. The vagueness of these terms is likely to give rise to confusion, uncertainty and further litigation. As for EU nationals arriving in the UK after the cut-off date (an arbitrary date to be set by the government, between 29 March 2017 when Article 50 was triggered, and 29 March 2019, when the UK leaves the EU), they will be able to stay during the ‘grace period’ of two years, but after that will be subject to UK immigration laws. Family migration – what rights? But even for those who retain their settled status, including those who become British citizens, the hard truth is that, in the field of family reunion at least, this will represent a significant diminution in their current rights as EU residents. Under the government proposals, although family members can join EU residents in the UK freely until the cut-off point, and will be eligible for settled status in line, British law will apply to those seeking to join them later. And British law reflects a profoundly anti-family bias so far as migrants are concerned, treating all family members as migrants first and foremost – and thus, as a threat. The UK’s default response to family settlement seems to be ‘not unless’. The immigration rules on bringing in family members are complicated and highly restrictive. Only British citizens earning over £18,600 can only bring in their partner; if they want to bring in a child as well, they must earn an additional £3,800, and a further £2,400 for each further child (or equivalent savings). Only children under 18 are eligible for settlement. Partners on the other hand must be over 18. Those from non-English speaking countries or without a degree taught in English can enter only after passing an English language test, unless they are over 65 or physically or mentally ill, or there are ‘exceptional compassionate circumstances’. The couple must prove they have adequate accommodation and that they will support themselves and any dependants without recourse to public funds. Entry is for an initial period of 30 months, but the partner must go through a five-year probationary period, at the end of which the same conditions will be applied and the relationship tested, before settled status is granted. As for children, a British lone parent cannot bring her children unless she can prove she has had ‘sole responsibility’ for them while they were living elsewhere. Children who are over 18, or who are leading independent lives or have themselves married, are not eligible to join parents here. So far as the entry of parents, grandparents and grandchildren is concerned (guaranteed under EU law), British law requires the person to need long-term personal care through illness or disability, which cannot be provided in their home country by anyone, even with the financial or practical help of the British-based relative, before they are eligible for entry. All these restrictions will apply to those EU residents who, after the cut-off date, seek to bring relatives to join them in the UK. They are not spelled out in the document setting out the proposals; but these are the rules which currently apply to family members of British citizens and those settled in the UK, and the intention which is spelled out in the document is that they will apply to ‘protected’ EU nationals too. Special status – or greater rights for all? Campaigners may seek to preserve the special status of EU nationals and their generous and humane family reunion rights by arguing for the UK to adopt the ‘standstill provision’ proposed by the EU and to apply it reciprocally to EU residents in the UK. The British government objects that allowing EU citizens to retain all their rights under EU law would make the UK subject to EU law – and to the jurisdiction of the Court of Justice of the EU – after leaving it, which would create a legal anomaly. But more importantly, rather than preserve a two-tier set of rules for family reunion, perhaps activists ought to be arguing for British immigration rules to be upgraded, so as to provide real family reunion rights which properly reflect the rights to respect for family life drafted by British lawyers (among others) in 1950 as Article 8 of the European Convention on Human Rights and Fundamental Freedoms. It is shameful that the rights of partners, parents and children to live together should be made subject to minimum-income provisions over and above the ‘no recourse to public funds’ rule. It is shameful, too, that elderly parents and grandparents should be prevented from coming to live with their adult children who guarantee their support in the UK. Perhaps these proposals for EU residents, by highlighting the UK’s lack of respect for the family life of British citizens with ‘foreign’ family members, will galvanise a movement to make UK family reunion rules more human. 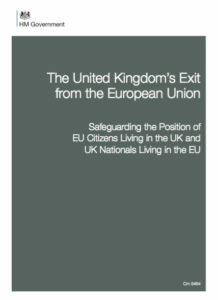 The United Kingdom’s Exit from the European Union: Safeguarding the position of EU citizens living in the UK and UK nationals living in the EU. Cm 9464, June 2017.